Antiques challenge. Natasha Raskin plays catch-up as she and fellow auctioneer Philip Serrell take a trip around Sussex and Kent before heading to auction in Rayleigh, Essex. Philip Serrell and Natasha Raskin. Do you know, there is one thing that you can rely on in this country. and a nose to sniff out antiques unlikely places. This is just the best, this is much better than antique shops. throw a little arrow in your direction. Our duelling duo set off in a 1957 Porsche with £200 each. Philip edged in front with £214.04 to spend. -Your purse is bulging now. You're over £200. It's about 12 quid better than we started, I don't know how many days ago. I'm almost £100 worse off than when we started. I've lost the plot, I think I got the rules wrong. their journey has seen them travel through the Home Counties. the fourth stretch has them going to an auction in Rayleigh in Essex. But, they're starting in Arundel. you'll be free from fleas for the rest of the year. Our experts first stop is Arundel Antiques. and has amassed quite a stock. Perfect, if you know what you're looking for. -So, what do you know about militaria, Phil? Most of it comes from the military. Most of it, that's sounding good, yeah(!) Thanks. Philip spots something in David's window display. -The flying leather helmets and goggles, old? And what the ticket price on those? -The helmet and the goggles, £140. Bit of room for negotiation on these prices? Well, £140 was kind of calculating a bit of a knock, 120? OK. And that figure, is that plaster or wood? -It's wooden, Florentine, 17th century. You couldn't do it for £17? -I couldn't, actually, no. Thank you so much. You've got to try, haven't you? OK. This looks a bit more my cup of tea. Less militaria, more stuff. But it's, very nicely set out, isn't it? Very nicely set out. think that this is antiques in a kind of retail, retail style. But, we'll give it a good shot, see what we can find. Better if you take the covers off, Phil. -Oh, yeah. That's quite a good old piece. -Is 35 the best, or can we get under 30? -Um, 28. How about that? let me just have a wander around see if there's anything else I can see. As Philip continues his search, Natasha finds David. "but not common kind of scale?" We've got some bargains. Would you like to follow me? -We'll go and have a little look. -I'd love to follow you. Thank you so much. Maybe you're going to save me. What do you have in mind? Well, I think these are quite interesting. Two albums of cigarette cards from the 1930s. -Right, OK. Something I've never bought before. -So you've got all the insignias in there. They're totally complete and in marvellous condition. The first in the UK were introduced by John Player & Sons in 1893. Because of the popular subject matter, will still be of interest. Oh, I hope so. And do you think in this sort of quantity they'll be... Oh, hello! -Please take your eyes off my lovely RAF badge cigarette cards. We've not talked money yet, what do you think of these, Phil? Oh, I'd be happy to give 400 or £500 for those, I would have thought. -Sell them to him, we'll split it. What about 20 for the two, a tenner a piece? -Oh, I don't know. Can I have a look? -Naturally. I think they're a really good subject matter. because I don't really think there is one, is there? These two collections are complete, with about 50 cards in each book. So, what's the most you're prepared to pay? -Eight pounds sounds like a good deal to me. -No, because I'm going to be stuck with them otherwise. Oh, really! I get it. Well, shall we do it then? these at a third of their ticket price. And with one deal done, David makes his way over to Philip. He's spotted a 19th century boxwood truncheon. It's got a ribbed handle. -at some point in time. and then this is led filled. And they used to call these life preservers, didn't they? Which is actually the last thing in the world they did. -that really would just see you out, wouldn't it? Phil's still keen on the bronze propeller, too. Total ticket price for both items is £80. What could you do the two for? You caught me by surprise, cos I thought they were going to be more than that. I'd better pay you now. with some promising purchases for auction. Philip's moved on, and has motored the Porsche along the coast to Hove. to find out about a forgotten genius and pioneer of early cinema. is museum curator, Suzie Plumb. Welcome to Hove Museum and Art Gallery. This is pretty cool, isn't it? Do you want to come through here and have a sit down? You don't get many cinemas smaller than that, do you? at a time when live performance alone entertained the masses. He performed as a stage hypnotist, illusionist and psychic. he used a Magic Lantern and colourful slides. So, Smithy, he sounds like a really larger than life character. so he's working the Magic Lantern, doing performances around Brighton, at the Brighton Aquarium. which included live animals, monkeys. There's a hermit in a cave. So, he's an entertainer. demonstration of film by the Lumiere brothers. So, the Lumiere brothers, sort of, they pioneered, what? And our man George Albert Smith, what did he do? after he'd seen the first moving images in this country. And they would've most definitely been black and white and silent, wouldn't they? Smith turned his storytelling talent to film. Smith was really instrumental in developing what we call the narrative of cinema. Developing techniques and practices that enabled people to tell stories through moving image. So, he was the pioneer, wasn't he, really? Yes, certainly was one of them. but also by developing revolutionary camera technology. towards trying to find a colour film process. But Smith beats them all to it. -This is the Kinemacolor camera. Inside there's a wheel here that sits between the film itself and the lens. And this wheel consists of two filters. -And one half is green. is just a trick of the eye. where red and green spinning fast enough makes it look like it's colour. and he produced over 100 colour films. But in 1913, disaster struck. A court case brought by his competitors challenged his patent. allowing anyone to produce a colour film. After this court case, what happened to Smith then? Well, he stopped making films, sadly. And by that point, you know, this is from 1914-ish, the First World War comes along. But, also, it becomes a lot cheaper to produce films in Hollywood. Plentiful sunlight in Los Angeles made it the perfect place to produce films. By the 1920s, Hollywood had become the movie capital of the world. What happened to him, then? and was kind of forgotten about by the film industry. the value and the impact of his work on early film-making. became a global entertainment medium. and watch a film without thinking of my new best friend, Mr Smith. Next stop for Natasha is just along the coast, in Peacehaven. The town is located above the stunning chalk cliffs of the South Downs. This place may be small, but it's crammed full. and these are really sweet, these wee napkin rings. It's called pokerwork because that's exactly what it is. It's a hot poker that goes in and actually makes the design. We've got the actual stylised flowers have been lined out by the poker. And then the background has been, typical of its style, dot-dot-dotted in. Then they've been filled in in colour. But they're a little bit lacking in their colour. It's all come off, to be honest with you. And then I think maybe from the same sort of set is this one here. Let me just get it. There we go. and then the green and the blue all working together in harmony. but I think for its age, that's just such a lovely thing. The arts and crafts pokerwork pot has a ticket price of £20. Dealer Steve is on hand to help Natasha find some more goodies. There are some sweet wee things in here. I just have a feeling that novelty is what I'm after next. The enamelled one with the 19 on it. Yeah, that's really sweet. -What's that - 12 quid? Oh, it's a tie clip! -And it's the 19th hole. because I presumed it was going to be a nine carat gold. But it's not. It's just in a sort of rolled gold, or gold plate. I mean, the enamel's all right. It's not in the worst order you've ever seen. But it's kind of cool, isn't it? That's now two items Natasha has her eye on. -I absolutely love this little pillbox. and, sort of, shot an arrow towards my heart. I don't want to get too carried away, but what a lovely box. It's absolutely gorgeous. Do you mind if we do a closer look at that? -Right, OK. Thank you very much. Anything to do with Greek mythology is just my favourite thing. This pillbox has a 1992 hallmark. Hardly antique, but as it's not terribly old it is in pristine condition. "Yes I'm not a period piece, I am from the late 20th century. "the style of the early 20th century." It sports a ticket price of £24. There are things that I like in your shop, truly. I really like the pokerwork box. And I really like the tie pin. Then you've got this gorgeous hallmarked bit of silver as well. I wonder if you would be open to a sort of deal? You can tempt me, Natasha. And how often do you fall for temptation? -I'm a fool for temptation. -You're a fool for temptation! and, sort of, throw a little arrow in your direction, see how I get on. Try throwing a price at him! Just say... £30 the lot. I'm just going to say it, Steve? Make it 35 and it's yours. -35? For the whole lot? Steve, I can't resist. I'm now falling for you. I think that's an absolute deal. that had a total ticket price of £56 for just £35. I think these are going to fit perfectly into this pokerwork box. And I'll say thank you very much, wish me luck. It's been a pleasure, Natasha. -It's been really nice, thank you so much, Steve. And with that, one day down, one to go on the Road Trip. And Philip's in charge of the map. -but have you any idea where we are? You're in East Sussex. Ha! Yesterday, young Natasha spent £43 on four lots for auction. a novelty tie clip and a hallmarked silver pillbox. After that spending spree, she has £79.84 left today. Philip spent £40 on two items. A 19th-century lead weighted life preserver, and a ship's propeller. Philip has £174.04 left to spend. Our two experts have driven to the picturesque village of Golden Cross. -This is your stop, sir. Have a really good time. -Yeah, have a good trip. Philip's first to shop today. -How are you, Rhoda? All right? -You have some stock in here, don't you? A few bits and pieces, yes. Her shop is crammed with all sorts of goodies for Philip to have a look at. He's really casing the joint. Oh, look! By pumping these pedals down here. What you do is that, look. Now, I started out life as a PE teacher. Played a lot of rugby. Rhoda, how much is this? I think its way beyond your budget. Probably a very good thing. Right, let's go and see what else we can find. Yep, stick to what you know. These are quite interesting, Rhoda. How old do you think those are? I would imagine about 1910, something like that. I think they're quite interesting. -This is a drip pan. So, you put your candle in there, and this is a drip pan. off your beautifully patinated mahogany dining table. If they're by Benson, they could be worth a few quid. However, there's no maker's mark, and Philip's spotted a problem. That's just... It's been dropped, hasn't it? -If you look at that one. -If you look at that one there. And look at that one there. And it's just been absolutely... It's been dropped. Yeah, maybe Rhoda will drop a bit off her £25 ticket price. I could do them for 20. Is that your very, very best? What can I squeeze you down to 15? -No, not really as far as 15. -What could I squeeze you too? I'll have those, my love. Thank you very much indeed. Philip's leaving with the brass candlesticks for £18. Natasha has taken the Porsche onwards to the village of Burwash. of the Sussex Weald, which became sanctuary to a world-famous writer. and the residence of one particularly important gentleman. An extraordinary man with an extraordinary story. In 1902, Rudyard Kipling was at the height of his fame. and translated into many languages. in the secluded Dudwell Valley. Rudyard Kipling comes to Bateman's in the autumn of his life, really. But where did it all begin for him? He was born in India. those early years in Bombay, really had a big influence on him. and he started writing little stories. to, sort of, fill half-a-dozen pages. and they sold by an extraordinary amount, as well. By the age of 32, he was the highest-paid author in the world. Rudyard married and had three children. for the loss of the eldest of his three children to pneumonia. and that really did influence him. It took a long time to get over it. Josephine was just six years old. drawing inspiration from his new surroundings. Look at the view! His surroundings...! -He can't have lacked inspiration in here. by the time he moved to Bateman's. by this valley, this environment. It really did influence his work. for monetary reasons any longer. He can actually just write for the enjoyment. So he writes his stories for his children. and kept a meticulous record of every visitor. So, you've got extraordinary people. You've got politicians - so, Stanley Baldwin. You've also got people like Scott and Shackleton, the explorers. And you've got American presidents. George Clemenceau, the President of France - he comes here. He was the man to visit, I was going to say. Yeah. And even Mother gets a mention. Mother came on August the 4th, 1920. And he's annotated that "FIP". Yes, that's a bit of a personal joke, that Rudyard made. For many, many years no-one has actually known, really, what it meant. was able to come back and explain what "FIP" meant. -for people who fell in the pond. Yeah... It's interesting, because the pond here is not that dangerous. I've got a feeling it might've been closer to PIP, or Pushed In Pond. -that would love to have a good time. You can't throw your mum in the pond! Well, Rudyard certainly did by the look...! But this idyll was soon to be shattered. and Rudyard was to know personal tragedy for a second time. partly because of Rud pulling a few strings for him. but very much also for John's death, as well. he had once so delighted in crafting. the result of age, but also of grief. to really carry that burden of outliving two of your children. he experiences so much tragedy himself. all this literary genius comes out of all that tragedy, as well. and journeyed to just outside the East Sussex town of Battle. Although this doesn't look like an antiques shop. Much better than antiques shops, this is! Anybody can go and buy stuff at antiques shops. Natasha, this is where you should be. Jon's taking Philip to a storage unit. -you're welcome to have a look at. -Can I have a wander? Let me see what... I can find all the company records in here. Only Serrell would go looking for a bargain by torchlight. Can I drag this out? but could we take that outside and put it into some daylight? -Hopefully John will know what it is. -You know, I've no idea! These clearly go round and round. Everyone knows that's a cast-iron saw-sharpening stand, right?! It does all work, doesn't it? It's been sitting up there for... years and years. When would've been the last time that this was used? -Would've been 20 years ago, at least. -That it was used. At least. -It's cool thing, though, isn't it? that can be upcycled into something trendy. Can I... I'll have a deal with you at 15 quid. Philip's nose for a unique buy has bagged him his fourth lot for auction. Got to lug it to the car now - Gordon Bennett! just north of Romney Marsh. was once the local blacksmith's. Today it's home to Old Forge Antiques. Hello! Hi, there. You must be Steph. -Hello. Hi, I'm Tasha. Lovely to meet you. And you're in charge of this place, but not all of your stock. Not all my stock, no. OK, so I'll go and have a wee look. I'm sure I'm going to be asking for your assistance, Steph. -So I'll see you in a bit. Natasha has just over £79 left in her pocket. But there's one here that is not crazy expensive. It's £63. So, first of all, I thought - "Why's it only £63? "Maybe it's repro or something." But, actually, it's really nice. A lovely mahogany finish, and it's really nicely carved and turned. It's got everything you'd want from a nice toilet mirror. So it would work in any interior. But, at the back, it's a bit of a mess. has all split and it's been repaired. it's a bit of a mess, the original mirror. but, personally, I'd only want to be paying £30 for it, or so. So I don't REALLY know...if that's going to work out. This one's £55 and it's marked "AF" - As Found. is because of this really poor glass. Yes, but that's reflected in the ticket price. the con is the back. and the glass, but the pro is the back. and this one has that. staring at her in the face. Currently they have a combined price of 63 plus 55. Some fast math tells me that's £118. But I was going to make you an offer that's a little bit cheeky. It would be, sort of, £32.50 a mirror. I'll do them for 70. -You're quite happy with that? What a deal! A £50 discount. Could these two mirrors be the lot to give Natasha a big profit?! Just outside the village of Appledore is Philip. housed in the original railway goods shed of the Hastings to Ashford line. -Hi. How are you? I'm Philip. -Good to see you, Kelly. How are you doing? ..Philip wastes no time in getting down to business. That's a bit of fun, isn't it? That clock. You got a bent second-hand, my love. There's nothing wrong with a bent second-hand. -Unique, maybe, but does it work? -There you are, look. It's off. There you go. You hardly notice it's bent now. Clearly a career in sales was destined for you, Kelly. Oh, now, there's a problem, Kelly. Look. Kelly, it stops after 29 seconds. This is really very unusual. It's a stopwatch that stops! you've got to do it in 29 seconds, otherwise you've had it, really. It's a very rare 29-second stopwatch. So why has that stopped, Kelly? -Possibly because the hand's bent. Thankfully, yeah. So... So are you, I reckon. -Those are quite interesting, aren't they? Philip's found three carved-wood friezes. Originally, they would have been over a door or fireplace. -So these have come from India, right? the middle and both ends of not very much, over there. They're priced at £40 each. and ask what his lowest would be for the three of them. I tell you what, you could do. -Ask him what his best would be for one, two and three. £50 and £80 - something like that. -I'll go and give him a call. And see what he can do on them. All right, you're an angel. Thank you. I think those are quite fun things. in this day and age, it is upcycling. It is turning things into other things. I think those are really good decorators' lots. That was quick. Kelly's back. For one it's has got to be the 40. We can only really drop another £10. -You could do them for £110. No. That wouldn't work for me. Let's put that one there. I think Kelly knows a cheeky offer for two of them is on its way. If you agree to 60 quid, I'll take them now. That's £20 off what the dealers asking for. You're an angel, my love. And I will take the flak for it. you in too much trouble with the dealer. And let me just sit and wonder if I've done the right thing, or not. as we're now off to auction. Here's a rundown of what Natasha and Philip picked up on this leg. and two large Victorian dressing mirrors. The five lots cost her £113. and the two Indian carved friezes. All that lot cost him £133. sort of half truncheon, half beater. and it will make double that at least, I'm sure of it. This really is Natasha's Little And Large Show. and then really gone large on the last one. They could do quite well. for £15 from a timber yard. He's been true to himself, and I'm sure it will pay off. It always does for the Serrell. and buys two toilet mirrors. You know, I think she could do quite well. because I was taking a bit of a risk, you know? We could be all square, after this one. and head to Rayleigh in Essex. which can trace its origins all the way back to the Domesday book. -It's really nice around here. -They must be very posh in Rayleigh. under the third generation of the clan. Oh, this is exciting. Good luck. will be wielding the gavel today. The candlesticks, I really like this lot. Arts and Crafts influence - should do really well. The little silver box... Lovely little thing. Shame it's the date that it is. I'd have liked it to have been of an Edwardian period. But I think it will still make about £30-£50. Let's find out. It's time for our experts to take their seats. First up, is that a silver pillbox. but will it make any money? £20 for it. 20, 22 online. You finished in the room? Internet bidding at £42. All done? -That's a good £30 profit there, isn't it? -That is OK! Oh, cool! First up for Philip - the two Indian carved friezes. Interest commission bid, I have. Must commence the bidding at £40. The bid's here with me on the commission at £40. 42 on the internet. 45 back with me. And five. Internet's at 55. 60 anywhere? £60, thank you, sir. One more? At £65, internet bidding, then. -I'll sell at 65. Fair warning. he'll be slightly out of pocket. Natasha's lovely novelty golfer's tiepin. Commission bids, two of them. Must start the bidding to clear the book at £15. 18 anywhere? Back in the room at £22. Advance, if you like. All done? All finished? -I can deal with that, Phil. -Well, it is going the right way, isn't it? Come on. Stay positive, chaps. A £13 profit isn't to be sniffed at. Next lot is Philip's salvaged saw-sharpening stand. 20 straight in, please. At 20, thank you, sir. £20 yours. Back in the room at £28. All done? Are you all finished at £28? Philip's wandering off-piste has landed him a profit. Next under the gavel, is Natasha's pokerwork pot. 18, back on the commission. 18 now. Two bidders online now. £20 bid. All on the internet at £20. I'll sell to the internet, then. At £25. 28. Come along a bit quicker online. I'm selling. At £28. Hammer's going down. He eked that out for me, thank you. She's more than doubled her money with that. Up now, Philip's bronze propeller. 28, I've got. 30, if you wish, sir. Internet bidding is at £28. 30, new bidder. Thank you. By the gents, at £45. You all done? All finished 45? Another strong profit for Philip. Putting the pressure on Natasha. Can her two Victorian toilet mirrors turn a profit? Let's not waste time. £20 to bid straight in. £20 now. 20 bid. Thank you. At 22. Five. Eight. 30 bid. -New bidder. 60 I've got. Commission bid's at 60. Against you. Back in the room at £60. -Commission bid I've got now. £60. Out on the phone? All done. Fair warning at 60. Hammer's going down. Och, well! What can you do? What can you do? I tried. Philip's candlesticks in the style of Benson are next. Two commission bids on this lot, ladies and gentlemen. Must start the bidding to clear the book at £50. 50 is bid. 55 online. 60 I've got. £75. Commission bids are out. 75 online. 80 if you like. £75, internet bidding all done. All finished. Last chance then. I sell to the internet at £75. -You're a legend! You're a legend! A very healthy gain for Philip. Next, Natasha's cigarette card albums. She bought two for £8. Commission bids. Two of them. Must start the bidding at £20. -£20 advance if you wish. Back of the room at £38. I am just so, so pleased. At £38. Hammer's going down. Another canny buy gets Natasha a great profit. Must commence at £60. 60 bid. Five anywhere. You coming in, sir? 80. One more takes it. £85, any advances. Are you all done? All finished, fair warning. At £85. A cracking result and a lovely profit. And what's more, I think you're driving. No, I'm wearing heels. If you don't mind. Yeah, but I am, as well. Natasha has made a gain of £42.80. has £165.64 in her kitty. Philip made a gain of £111.36 after costs. to start the final leg of the road trip. Phil has a bit of a wobble. While it's all fun and games for Natasha. 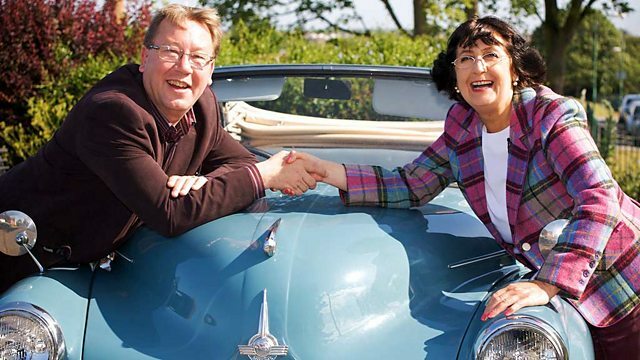 Natasha Raskin plays catch-up as she and fellow auctioneer Philip Serrell take a trip around Sussex and Kent before heading to their penultimate auction in Rayleigh, Essex.